Itâ€™s a bug eat bug world in your garden. In fact, if you take the time to sit in one place long enough you can often see life and death struggles going on all around you. Predatory wasps attacking caterpillars, battalians of different ant armies waging war, ladybeetles feasting on aphids, and so on. It’s like a continuously running science fiction movie in miniature. Probably one of the reasons we have so many insects living and dying in our gardens is because we manage the place with a philosophy of benign neglect, only using chemical sprays on very rare occasions when we are desperate. Mostly, we just let nature run its course, and things seem to always work themselves out. Of course, there are a few marauders that we will gladly remove by hand when we see them—Japanese beetles and tomato hornworms are too very obvious pests that are easy to manually eradicate. Another way we keep some of the more irritating insect visitors at bay, without resorting to chemicals, is to use biological controls. For example, if we did not spray our broccoli or cabbage plants they’d be devoured by the bright green, wormlike caterpillars of the Cabbage butterfly. We defend the plants by spraying them every 10 days with Bacillus thuringiensis, a naturally occurring bacterium that paralyzes the caterpillars’ digestive system. A side benefit of using Bt rather than a more potent chemical is that it effects a specific target, and does not hurt other insects. Aphids are another problem that we occasionally have to deal with because their populations have a tendency to explode. For them, we rely on insecticidal soap. Overall, it’s a rather benign compound, yet it’s deadly on aphids and other pests. Probably the most “natural” way to fight insects is with other insects. Praying mantises, for example, are six-legged killing machines, constantly on the hunt for prey of any type. In the early spring, tie their egg cases to low branches and when the weather warms, hundreds of hungry baby mantises will hatch out and immediately start looking for a meal. Remember though, that mantises are not picky eaters, so they may devour a few good bugs like honeybees as they make their rounds. 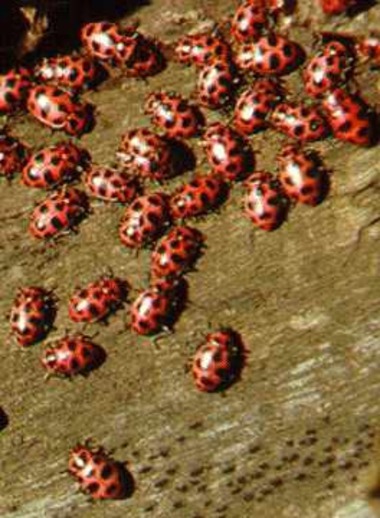 One of the most deceptive killers are ladybeetles. The larvae of these benign looking large lady beetle picturecreatures spend all their time snacking on aphids. Unlike the adults, the larvae are not all that cute. In fact, they resemble small, fuzzy black worms with tiny legs. 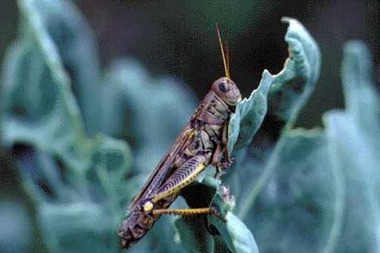 This is another reason not to run for the spray can the first time you see an unusual bug on your plants. You could be wiping out a beneficial insect that just happens to have an image problem. Of course, probably the best thing to do if you’re serious about keeping insect pests at bay is to do some research on the insects that are native to your region. The old adage “know your enemy” is an important one to remember if you’re going to wage war in the garden. A good field guide to insects is probably the best investment you can make towards a healthy garden. The last thing you want to do is panic and wipe out all the good bugs already hard at work in your garden. I&#x27;m learning, slowly, to trust the &quot;good&quot; bugs, even some types of wasps. I&#x27;m very allergic to insects...gravely in some instances, so I must be very careful. However, I&#x27;ve learned that if I display a non-threatening posture and energy, mind my own business, and don&#x27;t mess with nests, I&#x27;m typically not a target. Admittedly, when I moved to the tropics, I discovered bugs and pests that I&#x27;d never seen before...and was not very happy about. But education via the internet, books, master gardeners, and fellow gardeners has served me well. Thanks for the valuable info!